Truffles are edible fungi that grow underground, and are considered to be a delicacy because of their intense and unique characteristics and aromas. As truffles mature they develop odors and send off gasses and pheromones that signal to the surrounding wildlife that there is something tasty hidden under the soil. Historically, female pigs were used to hunt for truffles because they did so naturally. These days dogs are used more frequently, because they don’t eat the truffles they find and are easier to control. 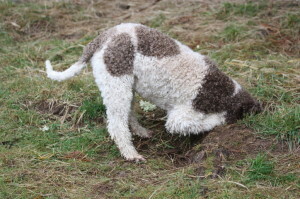 Although any dog can potentially be trained to hunt these precious tubers, the Lagotto Romagnolo has been particularly successful and is the traditional Italian truffle-hunting breed.